This amazing photo was taken by photographer and graphic designer Neil Sandbach in 2008. Neil was photographing some scenic shots at a farm Hertfordshire, England, as part of a project for wedding stationery; the couple planned to have their wedding ceremony held there.Later, Neil was astonished when he examined the digital photo on his computer. 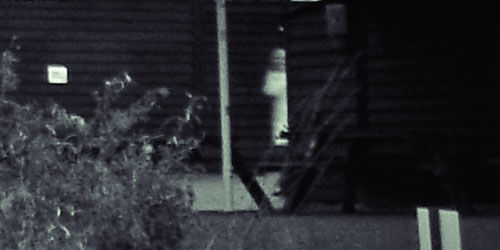 There, as if peeking around a corner at him, is a ghostly, white, almost glowing figure of what looks like a child.